(Natural News) Sesame has a long been used as food, medicine, and a part of spiritual rituals. The ancient Babylonian Empire (now part of modern-day Iraq) used sesame oil to manufacture perfumes and medicine, and records show that ancient Egyptians used sesame both as medicine and for purification. Traditional Ayurvedic practitioners in ancient India combined powdered sesame seeds and a warm sitz bath to treat amenorrhea and dysmenorrhea. These days, sesame seeds are sought after for their rich nutritional value: They are packed with protein and contain fiber, vitamin E, thiamine, riboflavin, and niacin, as well as minerals such as copper, zinc, magnesium, manganese, phosphorus, iron, and calcium. Sesame oil, in particular, is composed of 38 percent monounsaturated fat and 44 percent polyunsaturated fat, which are both good for the body. The seeds also contain unsaturated fatty acids oleic acid and linoleic acid which have antioxidant properties. These help fight inflammation, normalize the heartbeat, widen blood vessels for better circulation, and lower lipids and cholesterol. An ounce of toasted sesame seeds contains around 28 percent the daily value of calcium based on a 2,000-calorie diet. A cup of nonfat dairy milk, in comparison, has approximately 31 percent of the daily value of calcium. Phytosterols, one of the active compounds in sesame, are known to slow down cellular damage. Consumed in significant amounts, these also lower cholesterol levels in the blood. A group of researchers who cultivated a sesame variety with twice the amount of fat-soluble lignans sesamin and sesamolin found that these facilitated fatty acid oxidation which, in turn, reduced serum triglyceride levels. A recent review of scientific literature revealed that hypertension patients in five clinical trials showed decreased systolic blood pressure and diastolic blood pressure levels after sesame intake. Of the three studies that included a lipid profile, two showed significant reductions in total cholesterol and low-density lipoprotein cholesterol levels. One study showed a significant rise in high-density lipoprotein cholesterol or good cholesterol levels in the sesame treatment groups. Sesame seed and sesame oil have been studied for their cardioprotective properties. Daily intake of sesame oil enhanced vascular function more than it did consumption of corn or olive oil hypertensive men under medication. A randomized, placebo-controlled trial showed that sesame paste ground from unhulled seeds improved lipid profiles in diabetic patients. Researchers concluded that drug treatment and dietary changes including consumption of sesame seeds may prevent complications from cardiovascular disease and diabetes. 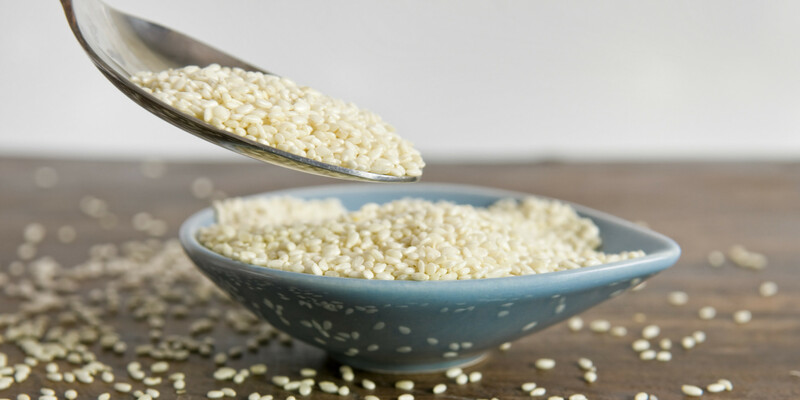 You can add sesame seeds to your diet and savor its nutritional value to the hilt. Here’s how. Add sesame seeds to a side dish for added crunch and flavor. Include sesame oil in the dishes you cook. Make your own sesame milk. Roast, crush and sprinkle sesame seeds and include them in your salad. Make yourself some tahini from roasted sesame seeds and vegetable oil ground to make a thin paste. You can’t have too much of sesame seeds. They’re small in size but big in nutrition.